How to apply the built-in templates to make flipping catalog on MAC? Whether have you created flash flipping product catalog on MAC? 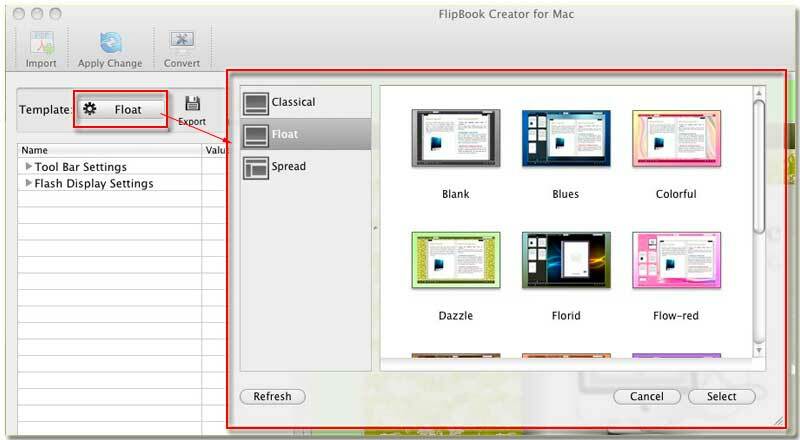 FlipBook creator for MAC specially enables you to convert PDF to page-flip book, magazine, comic, catalog, etc. You can adopt any templates built-in to quick build page-turn flash digital catalog. There are three main sorts as same as FlipBook Creator (Pro): Classical, Spread and Float. If ask what’s the difference among them, it must be their each outline and functions structures. From the literary sense, you could know a little about it. Every sort provides dozens of rich templates. You can apply them to your catalog and then on the base of them to re-design for getting approach your own style. Step1: click the button afterward “Template”. Step2: On the right pop-up window, choose which sort of template. Step3: Click one template thumbnail to select it, then click the below button “Select”. Step4: On the top menu line, click the button “Apply Change”. Note: as the matter of fact, if you have used FlipBook Creator (Pro), you must operate it well.